This is a full set of 4, front and rear performance drilled & grooved brake discs to fit the vehicles listed below. 275MM X 25MM 4 STUD FRONT VENTED. 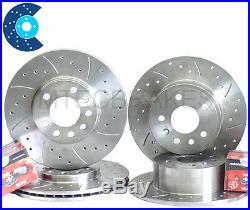 REAR DISCS 279MM X 9MM. THIS KIT COMES COMPLETE WITH MINTEX PADS FRONT AND REAR. If your fitment is not listed, check our other items and our shop. MTEC Brakes discs can be supplied in drilled and grooved, grooved only, dimpled and grooved or drilled only, all at the same price! Key Benefits of MTEC Discs. The grooves help deglaze the pad and prevent fade which occurs when the pad and disc gets too hot! The holes help to keep the discs cool and dissipate heat! The grooves also help to channel water away from the disc surface! They add the finishing touch behind alloys! No modifications needed to fit! Straight swap for your old standard discs! Best results will be seen with premium branded pads, although these discs are fully compatible with budget pad types. We can also supply Mintex Redbox pads. Motorsport Tunning & Engineering Company established in 2004. We are a UK based company that specialise in the manufacturing and supply of performance brake discs and brake pads. Our discs are machined using state of the art CNC machines which ensure all designs are cut with precision. IV, HS, KA27-28, KW, PA20-49, PA60-78, PH17-26, PH30-44, PH49-50, ZE, TR21-25. MINTEX XTREME HIGH PERFORMANCE BRAKE PADS. Mintex Xtreme brake pads are engineered using a unique range of friction formulations known as the Mintex X-Series. These advanced medium-metallic friction materials provide a more optimum balance of high-performance and long-life, with a wider operating temperature range than many so-called high-performance brake pads boasting materials such as ceramic or kevlar in their make-up. Mintex Xtreme brake pads use a range of unique friction formulations - X-1, X-2, X-3 or X-4. Each formulation is designed to suit either front or rear-axle braking systems. Their high-friction / low-fade characteristics, together with excellent high-temperature integrity make them ideal for high-performance and modified brake systems. A high-density platinum silver finish is applied to Mintex Xtreme brake pads to provide a durable anti-scratch finish, highly-resistant to surface corrosion. The foil shim applied to the back plate of Mintex Xtreme brake pads uses an advanced adhesive to create a direct contact between the brake pad and the caliper piston. Longer-lasting than conventional adhesive shims, the Mintex Xtreme high performance shim virtually eliminates both vibration and off-brake noise. The item "Corolla T-Sport 1.8 VVTL-i Drilled Grooved Brake Discs Front Rear & Brake Pads" is in sale since Tuesday, January 12, 2010. This item is in the category "Vehicle Parts & Accessories\Car Parts\Brakes & Brake Parts\Brake Discs". The seller is "mtec100" and is located in uk. This item can be shipped worldwide.